The IT Technician is comprised of naval personnel who maintain and operate the Network of any shop or shore information network systems. This Navy Enlistment Classification specializes in the area of Network Administration. Everything from technical assistance to computer system users to answering questions and/or resolve computer problems for the command, the IT Technicians are an invaluable source for complete success of any military operation. When you think of the IT professional in your local computer store, the Navy IT Technicians are the same guy just in uniform. Their primary job that the rest of the command see daily is the assistance concerning the use of computer hardware and software, including printing, installation, word-processing, electronic mail, and operating systems. But they are qualified to do and they do so much more than what the war fighter will ever see. The Navy Enlisted Classification (NEC) system supplements the enlisted ​rating structure in identifying personnel on active or inactive duty and billets in manpower authorizations. NEC codes identify a non-rating wide skill, knowledge, aptitude, or qualification that must be documented to identify both people and billets for management purposes. 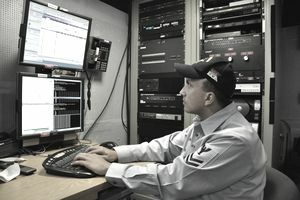 Operate external communications suites in the High Frequency (HF), Very High Frequency (VHF), Ultra High Frequency (UHF), Super High Frequency (SHF), Extremely High Frequency (EHF) Radio Frequency (RF) spectrums, and the Automated Digital Network System (ADNS) for controlling RF assets with limited supervision. 3. Performance Management of ship and shore IT communications systems. When you qualify to become a Navy IT instructor, you will constantly be updating certifications in the every changing IT world and be extremely marketable once you leave Naval service. There are also civilian contracting occupations that offer outstanding pay and benefits doing the same thing you were doing as a military member. Information Systems Technicians are also sought after by Special Operations Commands in the Navy. Billets in support of the Naval Special Warfare Development Group, SEAL teams, NSW Units, Special Boat Units, and EOD Units are highly competitive and require passing the same rigorous fitness test required of these unit's operators to join. These sea tours will require you to deploy as Naval Special Warfare support units and have a relatively high operational tempo (OPTEMPO) - meaning you will be going on many trips training within the United States as well as abroad conducting support duties of Special Ops missions.